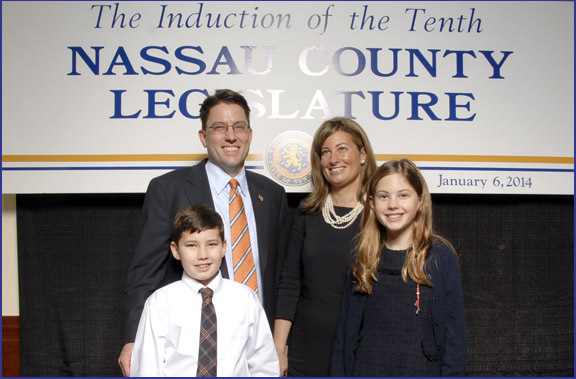 On January 6th, Donald N. MacKenzie had the honor of being sworn into Office as Nassau County Legislator by the Honorable Joseph N. Mondello, Chairman of the Nassau County Republican Committee. Legislator MacKenzie represents Legislative District 18 which includes the Northeast quadrant of Nassau County – Lattingtown, Bayville, Centre Island, Locust Valley, Mill Neck, Oyster Bay, Oyster Bay Cove, Cove Neck, Mattinecock, the Brookvilles, Glen Head, East Norwich, Muttontown, Laurel Hollow, East Hills and Greenvale. This is Legislator MacKenzie’s first term on the Legislature. At the legislative meeting on the same day, Legislator MacKenzie was also elected to hold positions on five legislative committees. He is the Chair of the Veterans & Senior Affairs Committee, Vice Chair of the Public Safety Committee, Vice Chair of the Towns, Villages & Cities Committee, a member of the Public Works Committee, and a member of the Economic & Community Development & Labor Committee. Legislator MacKenzie is an attorney and the former Commissioner of the Oyster Bay Water District with significant municipal experience. He lives with his wife and 2 children in Oyster Bay. His goals for this term include completing the steps necessary to fix the county tax assessment system and making government more accessible. He will also work closely with the other members of the Republican legislative caucus to continue to hold the line on property taxes. ⇐PreviousJanuary is “Carbon Monoxide Awareness Month"